9-CD box/1DVD (LP-size) with 176-page hardcover book, 248 tracks. Playing time approx. 686 mns. 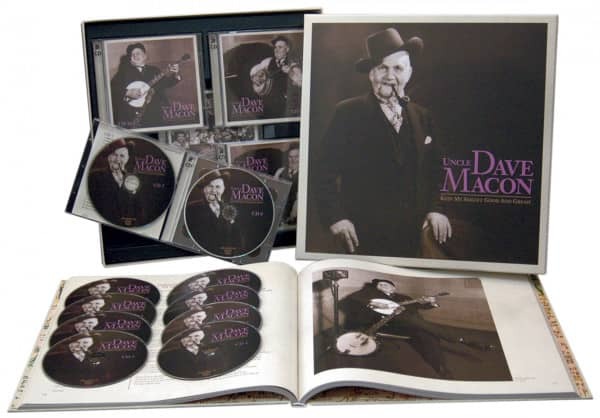 If Jimmie Rodgers is the Father of Country Music, then Uncle Dave Macon is surely the Grandfather. He brought dozens of old folk songs, vaudeville songs, blues, gospel songs, and comedy songs into the Twentieth Century. He was one of the first country stars to record, the first star of the Grand Ole Opry, and one of the first members elected to the Country Music Hall of Fame. Above all, he was an entertainer supreme, and one of the most accomplished banjoists in country history. Robert Nobley, a newly researched biography by Charles Wolfe, and a revised discography by Ralph Rinzler, Norm Cohen and Tony Russell. ‘Folks – if you ain’t right, get right. And let your conscience be your guide, because I’m going to play with more heterogeneous constapolicy double flavor and unknown quality than you!’ - Uncle Dave Macon. ‘Uncle Dave Macon was the most unique individual I ever knew. Everything he did was the Uncle Dave way. When I started out, he was the biggest star on the Grand Ole Opry, and when we toured, it was Uncle Dave who drew the crowds for Roy Acuff.’ - Roy Acuff. ‘Uncle Dave was probably our first rock star. He brought a lot of good music to the table, and he knocked the door down for all of us to be characters that played country music.’ - Marty Stuart. ‘He may not have been the best banjo player or the best singer, but he sure as heck was the best something.’ - Curly Fox. ‘And now friends, here he is, Uncle Dave Macon, the Dixie Dewdrop, with his pug hat, chin whiskers, and that million dollar Tennessee smile. Take’er away, Uncle Dave!’ - George Hay, founder of The Grand Ole Opry. ‘Long Live Uncle Dave’ - Pete Seeger, April 2004. There was in those days a big old two-story frame house out on the Woodbury Pike near Murfreesboro, Tennessee, in the dusty little community called Kittrell. What locals called the Woodbury Pike was actually Highway 70A, one of the major routes crossing the state to the eastern mountains and Knoxville. Truck drivers, vacationers, bus passengers all looked at the house with curiosity, but many of them recognized the name on the house. Certainly the locals who lived nearby knew – it was hard not to. Across the top of the long front porch was a sign that said 'Uncle Dave Macon,' and to the right was a big wooden picture of a genial older man holding a banjo and grinning a big gold-tooth smile. "I want people to be able to find me in case they want me to come and play for them," the owner of the house explained to the curious. Back in the 1930s, people were having little trouble finding Uncle Dave Macon. Churches came to him to see if he would help them raise money; auctioneers came to him to get him to play for country sales to attract bidders; vaudeville bookers came with offers to play tours that ranged from Boston to Florida; schoolhouse superintendents came to him asking for a show to help buy books in Depression-wracked rural districts. Even the bank of nearby Woodbury came to him when they finished building the new bank and had to transfer all the money from the old one: could they hire Uncle Dave to sit on top of the wagon with the money chests and play his banjo during the move? Surely no desperado would dare to try to rob a wagon that had Uncle Dave Macon sitting on top of it. People all over Middle Tennessee knew David Harrison Macon and were used to seeing him at local schools and on the little courthouse squares. He was the one with the chin whiskers, the red suspenders, the gold watch and chain, and what Judge Hay at the Grand Ole Opry called "that million dollar Tennessee smile." He was the one with the hat that bore the hat band slogan 'Old But Regular,' that twirled his banjo like it was a baton and fanned it with his hat, and that refused to drive a car because they weren't as dependable as mules. But he was also the one that was heard every Saturday night on the Grand Ole Opry, and that was featured on dozens of Victrola records put out by Vocalion, Brunswick, RCA, Okeh, Champion, and Montgomery Ward. He was the one who was country music's first real superstar, winning a national reputation years before Jimmie Rodgers or The Carter Family ever stepped into a studio. For years he was the most popular single performer on the Opry, a grand old man whose humor and personality won him fans everywhere. He was the first artist to make style a part of country music. As one of his fans said, "He may not have been the best banjo player or the best singer, but he sure as heck was the best something!" David Harrison Macon had roots running deep into Tennessee history. He was born October 7, 1870, in the community of Smartt Station in Warren County; in Uncle Dave's own words, "I was born near the beautiful mountain town of McMinnville." His father was Captain John Macon, born in Warrenton, North Carolina, in 1829 and a Civil War veteran. His mother was Martha Ann Ramsey, a native of Viola in Warren County, born in 1838. The 1870 census for the 9th Civil District shows David Harrison was the ninth child born to the family. The oldest was a daughter Lou (born 1856), followed by Vanderbilt (b. 1857), Betty (b. 1858), Samuel (b. 1860), George (b. ca. 1862), John (b. 1879), and Sallie C. (b. ca. 1867). After David Harrison would come two younger children, Bob (b. 1875) and Pearl (b. ca. 1879). Some of these siblings – especially Lou and Bob – would play important roles in Uncle Dave's later career. Captain John Macon was a well-known and popular figure in Warren County. His own father was a Henry Harrison Macon, who in turn was descended from a Revolutionary War hero, Colonel John Macon, and from his uncle, Nathaniel Macon, a North Carolina Congressman and one-time Speaker of the U.S. House of Representatives. Sometime prior to 1830 Henry Harrison Macon settled in Warren County, on Hickory Creek, on a plot of some 600 acres. Before his death in 1851, Henry Harrison Macon expanded his holdings by over 2,000 more acres, and had established a distillery, as well as a saw mill, grist mill, and cotton gin. The Macon family Bible indicates that John married Martha Ann Ramsey on December 2, 1855, in Warren County. The young couple soon built a handsome house in McMinnville, and the Macon Brothers bought a grocery store, a tin shop, and a mercantile business downtown. All this, as well as John and Martha's growing family, was interrupted in 1861, with the outbreak of the War Between the States. Both Macon brothers closed their stores and joined the 35th Tennessee Infantry Regiment, sometimes called the First Tennessee Mountain Rifle Regiment, commanded by Colonel Benjamin J. Hill. John Macon helped to organized the 2nd Company D; it along with some nine others was mustered in at Camp Smartt, near McMinnville, on September 6 and 7. During the early days of the war, the regiment moved from Trousdale County to Bowling Green and finally to Shiloh, where they joined in one of the bloodiest battles of the conflict. Here the brigade the 35th was in suffered over 1,000 killed or wounded – over a third of its roster. Reorganized, the regiment fought in the northern Mississippi campaign, as well as at Perryville and at the Battle of Murfreesboro. The exact fate of 'Captain Macon's company' during the balance of the war is not clear; his regiment was reorganized and merged with others throughout the conflict, until their eventual dismissal at Greensboro, NC, on May 1, 1865. Nor are there any clear records to indicate exactly when Captain John returned home; he bought out his brother's share in the family businesses in 1862, and there is a record of the marriage of Joseph in 1865. We do know that by 1867 Captain John had reopened his store with a new partner. The world young David Macon was born into in 1870 was the grim world of the Reconstruction South. In Warren County, crops lay fallow, buildings were in disrepair, and money was in short supply. Still, two generations of Macon prosperity gave the family at least some sort of cushion, and the year young David was born, his father was still relatively prosperous. The census records gave his real estate value that year as $2000, his 'personal value' estimated at $4000 – over six times the average per capita income in the state at that time. The Macon household also included three live-in employees, two housekeepers and a 'male farm laborer.' Though the Macon family was large, it was well provided for; young David was soon attending school in town, and listening to some of the folk music from the region. His sister Lou was an accomplished pianist, and often bought the latest sheet music to try out in the family parlor. Through her, David picked up rudiments of singing and a knowledge of songs. The young boy was soon playing the guitar – he had not been introduced to the banjo yet – and picking up songs. Many years later, when asked if he remembered the first song he learned, he smiled, nodded, and proceeded to sing it. It was a comic piece called Greenback. Customer evaluation for "Keep My Skillet... (9CD & 1DVD mit 176-seitigem gebundenem Buch in LP-Grösse)"